JETTE VANDERMEIDEN has been creating textiles since early childhood. Studying weaving, embroidery, knitting and bobbin lace at college led her to find her strength in weave theory, structure and design of cloth. With her extensive knowledge of fibre related topics, Jette has been a consultant to museums, documentary researchers, and developers of weaving curriculum for college and private fibre arts programs. A prolific writer and teacher, Jette conducts classes across Canada, USA, England, Denmark, Holland and Belgium. 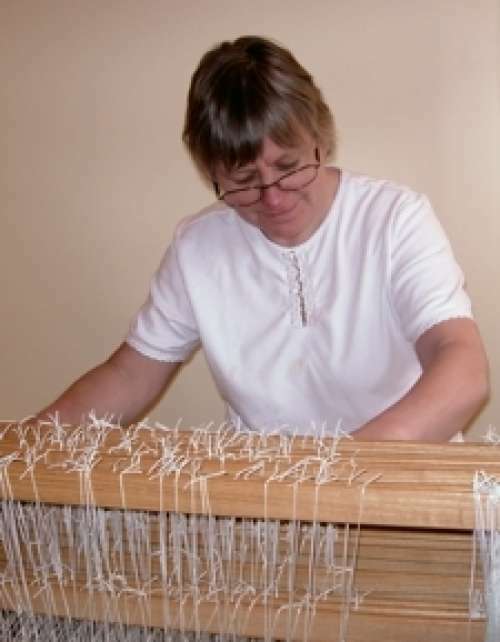 A member of Complex Weavers, Jette teaches double harness weaving, weave structure and interlacement at conferences, seminars and gatherings. She is a juror for weaving exhibitions at the international level. Jette weaves damask and Scandinavian weaves on her drawlooms, and has been a 10-year volunteer at the Ontario Science Center, working on the Jacquard loom. A series of YouTube videos to help weavers solve basic weaving problems (see Youtube.com/weavingwithjette) is popular. Jette’s goal is to share weaving skills so this ancient craft will continue to enrich our lives.